This year at CES, Clarion proudly showcased some of its latest technologies targeting semi- and fully-autonomous vehicles. 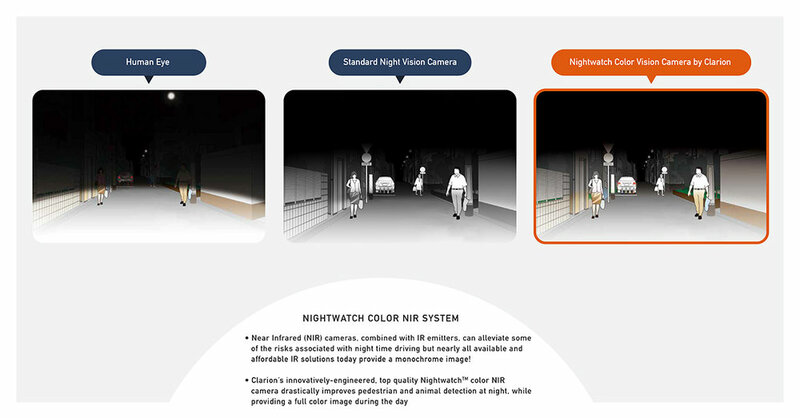 Among these technologies was NightWatch™, Clarion’s advanced Near Infrared (NIR) color night vision cameras. This technology combines a 2 Megapixel RGB camera with near-Infrared (NIR) illumination in order to capture a perfectly clear color image in all lighting conditions. This kind of technology has a multitude of benefits ranging from assisting driver vision while driving (or reversing) in very dark areas, to enabling crystal clear night vision for Advanced Driver-Assistance Systems (ADAS) and autonomous driving applications. The low-light and nighttime performance offered by NightWatch significantly exceeds that of standard vehicle cameras and in testing, greatly increases vehicle vision systems performance. NightWatch also greatly enhances the safety of the driver, passengers and others on the road. When used with surround vision camera systems like Clarion’s SurroundEye 360™, NightWatch gives the driver a more natural view of their surroundings, in full-color, day or night! The emitted NIR light clearly illuminates objects that are not easily seen with a traditional RGB camera or monochrome IR camera. In addition, NightWatch can distinguished between the “red” of a taillight versus that of a traffic light, allowing the driver (and the ADAS system) to have a clear understanding of what lies ahead. For vehicle design flexibility, Clarion offers NIR projectors that can be integrated into the vehicle headlights, cameras or body panels to illuminate dimly lit areas around the vehicle. Clarion’s NightWatch cameras come in both 70- and 190-degree field-of-vision options, for enabling crystal-clear vision for a variety of applications. For driver awareness applications, the visual output from the NightWatch camera system can be displayed in the instrument cluster, HUD, or any other low-distraction location.